Eruption is in progress. Seismicity is unchanged and has continued at an elevated level over the past hour. Short periods of increased seismicity, likely associated with explosions and pyroclastic flows, occur intermittently. Satellite imagery suggests that the volcano produces a continuous ash plume, which drifts to the NE from the vent. 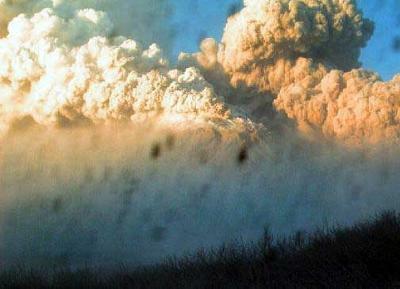 Augustine volcano has been in a state of continuous eruption since 14:30 AKST (2330 UTC) January 28. Over the past several hours, no large seismic pulses have been detected, such as those that occurred three times last night and correlated with ash rising 25,000 ft or more above sea level. Visual observations from an overflight today, as well as satellite data, show that an ash-bearing plume continues to emanate from the volcano, reaching an altitude of approximately 16,000 ft above sea level and extending roughly 90 miles (150 km) north. For up-to-date Ashfall Advisories and wind trajectories, please refer to the National Weather Service website: http://pafc.arh.noaa.gov/augustine.php. Thermal anomalies (measured by satellite-based instruments) persist, both at the summit of Augustine and on the northern flank, consistent with continuing eruption and hot pyroclastic flow deposits on the volcano. Direct observation of the island during today's overflight was mostly obscured by ash and clouds. Alaska Airlines has canceled flights into Kodiak & Anchorage. Other airlines probably have also. Check before you go to the airport to pick-up or depart.